Is George Osborne the UK’s equivalent of tea-party hero Paul Ryan? Mitt Romney today announced Paul Ryan as his vice presidential running mate. The global dominance of the US means that the candidates for this year’s presidential elections are of great importance for the rest of the world .. but non-Americans are unfortunately disenfranchised. So who is Paul Ryan and what is his platform? ‘One in seven Americans are now on food stamps, up 70% since 2007 – 45 million people in 2011 received Supplemental Nutrition Assistance Program benefits’ (1). Paul Krugman wrote about Ryan, in April of this year, that there are times “when that lack of empathy just takes your breath away.” The same lack of empathy that is only too reminiscent of George Osborne and his cuts to UK benefits, as the unemployed, low-waged and disabled can testify. In general, I’m a numbers and concepts guy, not a feelings guy; when I go after someone like Paul Ryan, I emphasize his irresponsibility and dishonesty, not his evident lack of empathy for the less fortunate. Still, there are times — in Ryan’s case and more generally for much of his political tribe — when that lack of empathy just takes your breath away. Harold Pollack catches Ryan calling his proposed cuts in Medicaid, food stamps and more welfare reform round two, and suggests that our current suite of safety net programs is “a hammock that lulls able-bodied people to lives of dependency and complacency”. First of all, if you think that welfare reform has been just great, read this extended Times report on the desperation of many poor Americans trying to survive in a depressed economy with a shredded safety net. It takes a monumental inability to imagine other peoples’ lives to blithely praise welfare reform’s results at a time like this. And if you look at how desperate you have to be to qualify for food stamps and Medicaid, the notion that these programs encourage “complacency” is breathtaking. Oh, and of course, being “able-bodied” in the current economy does not, remotely, ensure that you can actually find work no matter how hard you look. Ryan, we’re told, is a nice guy. And maybe he is, to people he knows. But he evidently has no sense of or interest in the lives of those less fortunate. Does that sound depressingly familiar? Isn’t this exactly the same reframing rationale for the draconian cuts to the UK benefits system? Furthermore, an assessment of George Osborne’s Comprehensive Spending Review (October 2010) indicated that if all his proposed cuts were implemented, spending in the UK would be less than that of the US by 2014/15 (3) Those spending cuts have barely begun but the UK economy has already tanked. Government borrowing has increased, the economy is in a double-dip recession, the budget deficit is rising (4) and, as a percentage of world GDP, the UK lost 1.6 percentage points – easily the worst performance of any European economy (5). 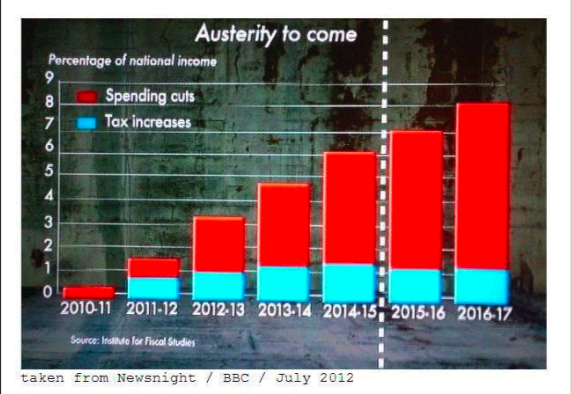 What will another 5 years of cuts do? Paul Ryan has established his reputation with the Republican base, by a Tea Party-infused plan for massive debt cuts. He is committed to huge cuts in federal spending, especially welfare, and ‘budget-busting tax cuts’ for the wealthy. George Osborne’s plan is for massive debt cuts, huge cuts in public spending, especially welfare, tax cuts for the wealthy and easing access to tax havens. So essentially, there seems to be no difference between George Osborne and Paul Ryan’s plutonomic world views, although the UK is clearly starting from a much higher base of public services than the US, and the necessity of first privatising. However, there can be little doubt that the aim of the Tory/LD Coalition government is to create not just the current conditions of the US but the conditions of the US under an ultra-conservative Republican administration. The bad news is that we may have a further two and a half years of damage from George Osborne’s economy-wrecking policies. But like Ryan, we are told that Osborne is a nice guy with a great sense of humour. And maybe he is, to people he knows. But he evidently has no sense of or interest in the lives of those less fortunate. The Coalition government far from abandoning this clearly disastrous and now discredited economic framework, have utilized the crisis to justify unnecessary cuts and a draconian process of dismantling and privatizing the Welfare State, the NHS and education.